A daily selection of more than a dozen oysters from both coasts, served with prosecco mignonette, guarantees that every diner will have the perfect bivalve. Servers are also well versed in the best wines to complement them. With a view of Nantucket Harbor, Cru, in the former Rope Walk spot, stocks 12 oyster varieties from both coasts. Expect seasonal dishes from executive chef and partner Erin Zircher, such as king salmon crudo with green harissa, cucumber, and lime. 1 Straight Wharf, Nantucket, 508-228-9278. Local oysters get dressed with house-pickled ginger, soy sauce, and fresh wasabi, and there is always a rotating “guest” oyster. The brunch menu offers specials like baked barbecue oysters with bacon, herb butter and cornbread. At Finz diners can enjoy innovative raw bar selections—such as oysters with a splash of Stoli Razberi, topped with wasabi tobiko caviar, or sake oyster shooters with ginger and cucumber—while taking in a spectacular view of Salem Harbor. 76 Wharf St., Salem, 978-744-8485. This bustling Kenmore Square eatery is best known for its extensive raw bar menu, and warmer weather also brings Maryland softshell crabs into season. Halibut ceviche with grapefruit, horseradish, and cucumber or the chile, orange, and sesame salmon crudo are inventive additions. At Legal Seafoods’ new outpost, you can enjoy the panoramic view of Boston Harbor from the first-floor raw bar, while a fishmonger and oyster shuckers prepare your seafood selections to order. Oysters have their own menu, detailing their port of origin and unique flavor profiles. 270 Northern Ave., Liberty Wharf, 617-477-2900. 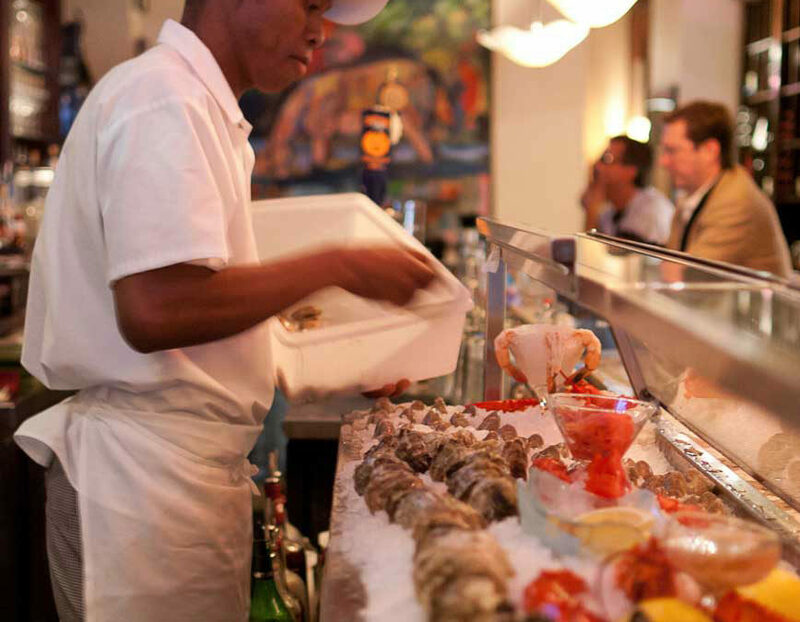 Mare Natural reopened in February as Mare Oyster Bar; the new raw bar displays the fresh offerings along with a shucking station. Oysters on the half shell are served with limoncello ice and blood-orange mignonette, with more varieties coming in summer. This trendy Hyannis restaurant offers the Cape Cod Jewel straight from its oyster farm in Barnstable Harbor. Diners can enjoy shucked-to-order oysters, or choose from six baked oyster preparations, as well as fresh oysters on the half shell with a variety of dressings. 410 Main St., Hyannis, 508-778-6500. While you will certainly find an impressive variety of shrimp and oysters, it is Neptune Oyster’s unique raw bar selections, such as razor clams and octopus, that will entice your palette. Twelve oyster varieties are on hand at all times and served with a prosecco mignonette and cocktail sauce with horseradish. Smith & Wollensky’s new waterfront location is an ideal spot to enjoy the restaurant’s Famous Shellfish Bouquet: a stack of jumbo shrimp, chilled lobster and crab meat, oysters, and clams, complemented by an array of sauces and sherry mignonette. Try any of the four oyster varieties raw, or order the Buffalo fried oysters with crumbled blue cheese. 294 Congress St., Atlantic Wharf, 617-778-2200.